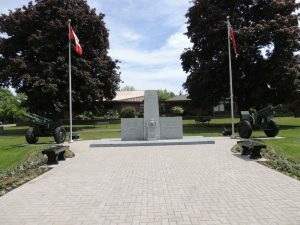 Final plans are now in place surrounding the annual November 11th Remembrance Day Parade and Ceremony in Carleton Place. With just over three weeks prior to this annual event, the organizing committee, spearheaded by members of the local Legion Branch #192, met on October 17th to finalize their plans to mark the 100th Anniversary of Armistice that will take place on November 11ththis year. It was on November 11, 1918 at 11:00 a.m. – At the eleventh hour, of the eleventh day, of the eleventh month, “the war to end all wars” came to an end. The guns finally fell silent, bringing to a close four long years of unspeakable war. Close to 61,000 Canadians were killed during this Great War and another 172,000 were wounded. Those who paid the supreme sacrifice included 47 of our own from here in Carleton Place. This year, The Royal Canadian Legion will assist in commemorating this historical 100thcentenary, through the introduction of a Bells of Peace Initiative to honour through Remembrance, the Armistice of 1918. The general concept derives from the use of bells as a celebratory announcement that the war had ended. This was common at the end of both WW1 and WW11. The Legion’s intent is to have every bell in every community across Canada ring in unison or independently (within each community) 100 times at sunset on November 11th, 2018 to signify the 100th anniversary of the WW1 Armistice. The Bells of Peace celebration will begin by a bagpiper playing on the East coast either in Cape Spear or St. John’s and end with a piper playing on Vancouver Island, possibly in Sooke, B.C. Here in Carleton Place, the organizing committee has plans in place for the participation in the Bells of Peace initiative through the involvement of Churches, Businesses, the Fire Department, the local O.P.P., various local organizations, and the general public. Rather than having a piper begin this initiative, the local Bells of Peace initiative will begin at 5 p.m. with the sounds of sirens from Ocean Wave Fire Trucks and local O.P.P. cruisers. They will be strategically positioned throughout the town and the sirens will sound for 30 seconds prior to the various bells being rung 100 times. Those participating in the ringing of bells in Carleton Place will be Zion Memorial United Church, St. James Anglican Church, and the Old Post Office. 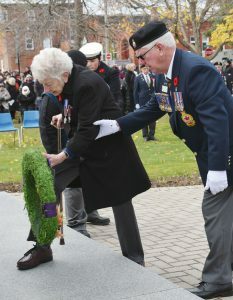 An informal gathering will also take place at the local Cenotaph at 4:45 p.m. on November 11th. Any resident related to anyone from Carleton Place who served during WW1 is invited to the local Cenotaph for this gathering and asked to bring any type of handbell with them that they can also ring during the ringing of the Church Bells. Relatives, along with all residents of Carleton Place are invited to this informal gathering and are also invited to bring any type of handbell with them to ring at this special ceremony. Members of our local Royal Canadian Sea Cadets #211 Lanark and Navy League Cadet Corps #181 Carlplace will also participate at this informal gathering by ringing their ships bell 100 times during the gathering at the Cenotaph. Pre-ceremonial events will also be taking place leading up to the November 11th events. On Saturday, November 10th, rather than holding their regular church service on Sunday, November 11th, Zion Memorial Church will hold a Candlelight Church Service at 6:30 p.m. At the end of their service, the congregation will carry candles across Veterans Way and place them on the walkway leading up to the Cenotaph. Around the same time, members of the Royal Canadian Sea Cadet Corps #211 Lanark, will begin with an all-night Vigil at the Cenotaph. While the Cadets will be utilizing our local library overnight for accommodations, members of the Carleton Place Girl Guides will be holding a sleepover at Zion Memorial United Church. Thanks to a most generous donation of Capone’s Restaurant in Carleton Place, they will be serving the cadets with a hot meal during their all-night Vigil. On Sunday, November 11th, the annual Remembrance Day parade and Ceremony will begin earlier than in previous years. The parade will form up on Mill Street at the Town Hall at 10:15 a.m. with the parade beginning at 10:30 a.m. Any Veteran who would like to be in the parade and is unable to march, is being asked to be at the Legion Branch no later than 9:45 a.m. to be placed in a vehicle that will be included in the parade. The ceremony at the Cenotaph will then begin at 10:45 a.m. in order to facilitate the first gun salute that will fire at 11:00 a.m. marking the 100th Centenary of Armistice. Zion Memorial United Church will be open prior to and during the ceremony for use of their washrooms and will be serving coffee or tea and water. Members of the local Carleton Place guiding group will be assisting. Road closures will take place to facilitate the parade and Cenotaph Ceremony with areas of Mill Street, Franklin Street and Beckwith Street being closed from 8 a.m. until the Ceremony has been completed. Residents and businesses are being asked to not park in these areas during this time. No parking signs will be placed in the areas where street closures will take place and everyone’s cooperation is being requested. Once again, a choir will participate in the Cenotaph Ceremony along with the Carleton Place and District Community Band. The choir will be comprised of members of the Zion Memorial Church choir, members of the Carleton Place Town Singers, and members of the St. James Anglican Church choir. During the service, a tribute will also be given to local hero Arthur Roy Brown, who is credited with shooting down the infamous “Red Baron”, Manfred Freiherr von Richthofen,100 years ago on April 21, 1918.